This map is imperfect: a sketch from a moment in time. Twelve aspects in the landscape of the Social Age, our new reality. I’ve used a map to illustrate the Social Age for the last few years, and decided to redraw it for 2018, but to retain the notion of incompleteness, the sense of a fantastic landscape to explore. The old map still holds true, as does this one, and as will the maps that you draw yourself, as you build your understanding and narrative around our new world. That’s the point: it’s not an urban landscape that we can know and master: this is a wild landscape, which we are only just starting to map. In this rendition, i’ve picked out twelve aspects of the Social Age, the twelve factors which are most recently on my mind. This is a foundational aspect of the Social Age: the abundance and democratisation of technology has shifted power from infrastructure owning organisations, to the hands of individuals and communities. It leads to our widespread connectivity, and ability to choose the spaces where we are engaged, beyond the oversight or control of any organisation. Democratised technology liberates creativity and innovation, whilst eroding the ability of any organisation or entity to exert it’s formal control. Another foundational concept: Organisations have spent much of the last forty years deconstructing and fracturing the Social Contract that exists between individual and the organisation. By treating people as assets, we have liberated those very people to consider their own individuality, to break their reliance on the Organisation as the central pillar of ‘career’, and to unify individuals into compelling and resistant Communities that exist, and persist (through the democratised technology) outside any organisational control. The Social Contract is broken because we broke it. And i don’t think it will ever be repaired. In the Social Age, the route to engagement is to be deeply fair, and to earn it. Organisations used to be the primary mechanism of collectivism at scale, but now there are perfectly good, socially moderated, alternatives. As collectivity, at scale, becomes easy, as we see the rise of the Social Community, all around us, and as we see those communities gain every more power, we see it becoming harder for any organisation to thrive without breaking down the walls, and engaging in these new spaces. ‘Community’ is no longer something that they can own and control, it’s something where individuals, who have earned high Social Authority, our Social Leaders, can gain a competitive advantage, by acting with humility, and engaging with fairness. The Social Age sees a broad rebalancing of power, away from ‘hierarchy’, into ‘community’, away from the formal, into the social. This is driven by some underlying features, such as the amplification of authentic storytelling, the democratisation of technology, which we discussed above, and the strengthening of reputation based authority, authority that exists outside of any formal system or moderation and control. ‘Career’ is no longer defined as a contracted period with one organisation, but rather a lurching series of engagements with many: portfolio, gig, distributed. So ‘career’ still exists, but no longer as owned and moderated by the organisation. In this context, some new organisations, third spaces, have emerged to try to claim that space (like LinkedIn), but also new communities, which hold the essence of our career. It’s through these third spaces, and the aligned communities, that we will increasingly be mentored, coached, guided, supported, and developed. It’s in these spaces, from where we can never be fired or outsourced, that our loyalty will lie. And the challenge for organisations will be to build productive and valued relationships into these communities. Indeed, i suspect that we will see organisations needing to contract to loosely connected labour unions, held entirely in these new spaces. The bedrock upon which many organisations and industries are founded is fragmenting: blockchain currencies, and community based banking, will decimate financial services, whilst ‘whole life’ views of healthcare will decimate ‘emergency and exception’ based healthcare provision. Closed loop recycling will demolish extraction and distribution industries, and AI will destroy hourly accounting industries. And that is just to start. Many organisations have a vague sense of the cracks, but very few are prepared for the absolute chaos and fragmentation that is about to hit. And it will kill them. The only thing that surprises me more than the quantum leaps in capability and potential offered by emergent AI and robotics, is the blind belief expressed by some senior leaders and politicians that they can somehow control it, or that it will work for the benefit of all. The robots are coming, and they will be making a lot of money, for a few people. Make no mistake, for every ‘sympathetic’ and positive application, there will be a levelling of old industry and work. Already you can hire a robot security guard in 21 states in the US and pay it $7 an hour (or rather, you can rent it for that price). I am willing to bet that it does not take breaks either. And, sure, it’s rubbish, but that’s not the point. This is just the start. The robots are coming: AI and automation will transform everything, much sooner than many people think, and in ways we may not like at all. This is an aspect of the Social Age that requires deep understanding: i despair when i talk to HR directors who recite HBR and TED talks. This is the time to employ deep expertise, and to build a deeply fair Social Contract by engaging in open discussions. I’ve used the word ‘fairness’ a few times already: an organisation that is ‘fair’, deeply fair, in everything it does, in the way it treats people, in the ways it engages in it’s community, will hold a competitive advantage. Organisations have long acted as though society is there to serve them, that they can pick and choose how they engage, but in fact the truth is the opposite: organisations exist to serve society. The people they employ ARE the society. The offices they open, the markets they sell within, the clients that they have, all are parts of the society to which they belong. In global organisations, it’s important to build out local community accountability and answerability. The domains of old, the pillars of many organisations and educational pathways, are being replaced, often faster than we respond. We no longer just need IT as a mechanism of infrastructure and control, we need an IT function that is facilitating and enabling. We no longer need HR as control, we need it as enablement, we no longer need innovations teams, so much as a deeply help capability to be innovative and curious. The Socially Dynamic Organisation will be lighter weight, scaffolded, and reconfigurable, at scale. It will be reconfigured to the need of the moment. I suspect that the organisation we exist within today are largely a remnant of Victorian engineering and mindset, based upon principles of collectivism and effect at scale, through the construction of hierarchy, specialism, domain building, and codified power and knowledge. But we need new models: ultimately, we will need new Organisational Design principles, new ways of seeing and being, which allow us to become truly Socially Dynamic. We must look beyond existing organisations, to the design principles of the organisation of the future: and then we must build it. Dominant modes of organisation are probably evolving: nations, organisations, religions, all of the primary mechanisms of social organisation at scale are being challenged: social communities, collectives, celebrity, relationship brands. Out of all this, emerge the Transnationals: organisations so large, providing infrastructure and much of the tangible capability and capacity of the Social Age (the infrastructure), and yet which exist beyond any simple country. These are emergent entities, not truly companies, but not truly countries either. Or not yet at any rate. At some point, we will see the conversation moving from ‘where you pay tax’, to ‘where you provide infrastructure’, and ‘where you exert influence’. When a Transnational directly engages in national policy, and does so with social mandate from a subscribed user base (a voluntary tax base…) then we will see a whole new wave of change. At heart, many of the places where we engage most heavily in the Social Age are based in relationship, not simply transaction. Sure: technology allows me to engage anywhere, but it’s HOW i am engaged that counts. Transaction may be efficient, but efficient is not engagement. These are just twelve aspects of the Social Age: alongside these, and the other aspects i have previously documented, we see the need for change, for transformation. We will need new skills as individuals, new capabilities within our organisations, indeed, we will need new types of Organisation. Socially Dynamic, deeply fair, able to constantly innovate, prototype, and embed change. 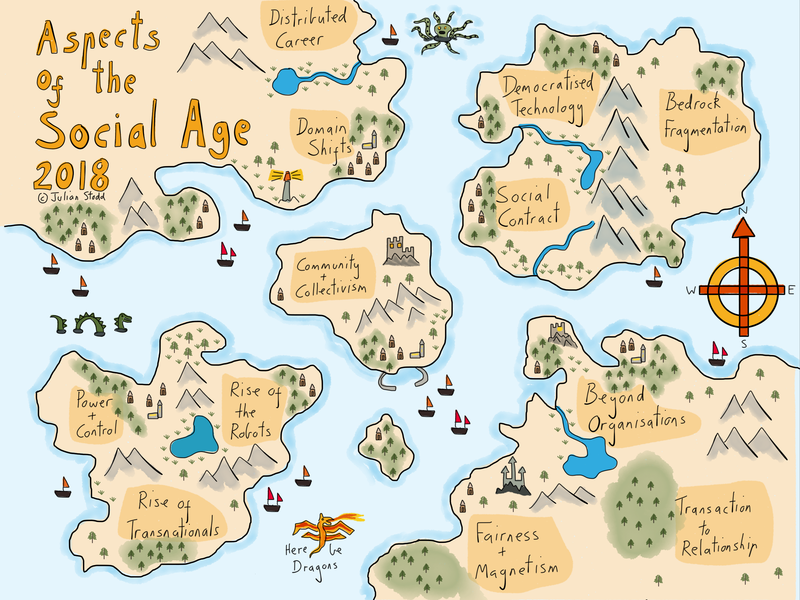 We are Explorers of the Social Age: nobody will have the whole map, but these sketches are shared as part of my own journey and, i hope to inspire others to challenge, adopt, prototype, learn, and share their own route. This entry was posted in Social Age and tagged Change, HR, Leadership, Map, Social Age, Social Leadershipo, Technology. Bookmark the permalink. Pingback: Project Lift | Collaborate with us on Communities – Week 1!